Jumping on a trampoline sounds pretty fun. Jumping on a trampoline while it’s rolling down a dirt road looks even cooler. That’s exactly what Dunkin Devils, a stunt team based in Slovenia, did in a recent Instagram post. It looks so awesome, it almost seems impossible. Of course, it’s not magic—it’s just physics. In particular, it’s a great example of projectile motion. Suppose you throw some object near the surface of the earth. If the only significant force on the object is the constant downward gravitational force, we call this “projectile motion.” Yes, that tennis ball you loft across the room is projectile motion. Flipping a coin—the center of mass is in projectile motion. As you can probably guess, a dude jumping on a moving trampoline is also an example of projectile motion. The horizontal and vertical motion of the object are independent (except for the total time). The vertical acceleration is constant (at –9.8 m/s2). The horizontal velocity is constant. That’s pretty much it. You can do a whole bunch of cool physics things using just those three ideas. With that in mind, let me show you my favorite projectile motion demonstrations. Did you notice that the two balls start at the same height and hit the ground at the same time? 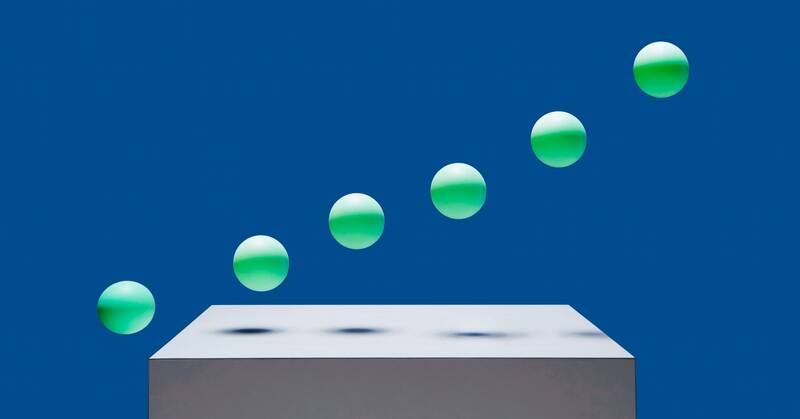 It doesn’t matter that one ball has a horizontal velocity, since this motion is independent of the vertical motion. Both balls start with the same vertical position and the same vertical velocity (zero m/s), so they have the same motion in the vertical direction and hit the ground at the same time. Pretty cool, right? This motion was created with a special device that shoots and drops two balls, but you can do something similar with just some coins. Put one coin on the edge of a table, so that it is just about to fall off. Take the other coin and flick it towards the edge coin. When they hit, the two coins will drop—but with different horizontal velocities. They will still hit the floor at the same time. Here is a slow-motion example of that. But wait! There’s more. What if you shot the horizontal ball at some superfast bullet-like speed? Maybe you could do this with an actual bullet? The MythBusters did this in one of their episodes. (I’m also a consultant on the show.) The trick still works, but you have to use a heavy bullet so that air resistance can be ignored. Historically, this is called the howitzer cart physics demo. A car is moving along at a constant speed on a horizontal track. At some point during its motion, the cart shoots a ball straight up in the air. Boom. The ball lands right back in the cart. Here’s what that looks like. What’s going on here? Actually, this is a lot like the previous demo, which shows that the vertical and horizontal motion of a projectile are independent. In this case, the launched ball has the same horizontal velocity as the cart. Since the cart and ball have the same horizontal velocity, the ball always stays over the cart and lands right back in it. The same thing is happening with the jumpers on the moving trampoline. You can try this on your own too. Just get in a car (have someone else drive) and wait until there is a part of the road that is straight and level. While the car maintains a constant speed, toss the ball up in the air (inside the car) and then catch it. You just did the same thing as the trampoline people—but it doesn’t look as cool. If you were able to see this tossed ball from outside the car, maybe it would look better. But it’s the same thing. If you take a garden hose and shoot the water at an angle, it’s essentially projectile motion. Remember—as long as an object only has the gravitational force acting on, its motion will be projectile motion. If you consider each little water molecule in the stream, this isn’t completely the case. The water molecule interacts with the rest of the water around it. However, most of these interactions add up in a way that they either cancel out or are negligible. In the end, you get water that acts like projectile motion. Oh, I even looked at the trajectory of a water path to show that it is indeed parabolic—just like projectile motion should be. If you don’t want to pull out your hose, you can also do this with a cup or a can. Try putting a small hole near the bottom of the cup and then fill it with water. The water will shoot out horizontally, just like projectile motion. But the cool part about this demo is that the initial speed of the water leaving the cup depends on the depth of the water. As the water drains, the “launch” speed also decreases. Now for something else to try. Take your leaking cup of water and drop it. While it’s falling there won’t be any water coming out of the hole. Why? Now that the cup (and the water) are falling, there is no longer any gravitational pressure to push the water out of the cup since the cup is also falling. Or, you could explain this the Einstein way: Since you are falling with an acceleration equal to the gravitational field, there is no gravity in the reference frame of the falling cup. No gravity means nothing pushing the water down and out through the hole. Suppose you take a ball and launch it from the ground with an initial velocity that is some angle above the horizontal (call that angle θ). After the ball leaves the launcher (or whatever got it moving), it moves up and then back down. At the same time it travels horizontally. The greater the vertical velocity, the longer the ball is in the air and the more time it has to travel horizontally. However, as you launch at greater angles the horizontal velocity gets smaller. So, you have a problem. If you launch at too high of an angle, the ball will be in the air for a long time but with such a small horizontal velocity that it doesn’t go very far. If you launch at too low of an angle the ball has a large horizontal velocity but the time is very short. You probably know that the greatest projectile distance happens with a launch angle of 45 degrees (warning—this is only true on flat surfaces). But maybe you didn’t know that there are two different angles that achieve the same range. If you shoot a ball with a launch angle of 25 degrees and another with a 65 degree launch angle, they travel the same distance. Here, check it out. This is a Python model for these two balls. If you want to run the model again, click the Play button. Or better yet, click the pencil icon and you can edit the code. You could change the launch angles and see what happens to the range. It will be fun. I saved the best for last. Imagine that you have a ball launcher and you want to hit some target that is hanging from the ceiling. How would you aim? If you aim straight at the target, the launched ball will travel in a parabolic path and end up below the target for a miss. You could probably calculate the correct launch angle (aim higher than the target) so that you hit it. Now suppose that as soon as you launch the ball, the target falls. The target is accelerating downward as the ball is traveling towards it. Could you hit a falling target like this? The answer: yes. Check this out. This seems crazy, doesn’t it? What’s going on? Perhaps it’s best to look at this situation in the free-fall reference frame. Imagine that as soon as the ball is shot from the launcher, you start falling. Now you, the ball, and the target are all accelerating downward at –9.8 m/s2. In this accelerating frame, it’s as if there is no gravity at all. The ball moves in a straight line and hits the target (which just remains stationary). In the non-falling reference frame, the ball and the target have the same vertical acceleration. This means that the change in trajectory of the ball due to gravity exactly matches the change in position of the falling target. The result is a hit. I really like this demo. The version you see above uses an electromagnet to hold up the target. There is a photosensor on the end of the launcher such that when the ball leaves, it breaks the infrared beam. With this break in the beam, the electromagnet turns off and drops the ball. My plan is to build a simpler version that uses an electromagnet that turns off when the ball leaves and pushes open a tiny switch. Maybe I will build that one someday soon.